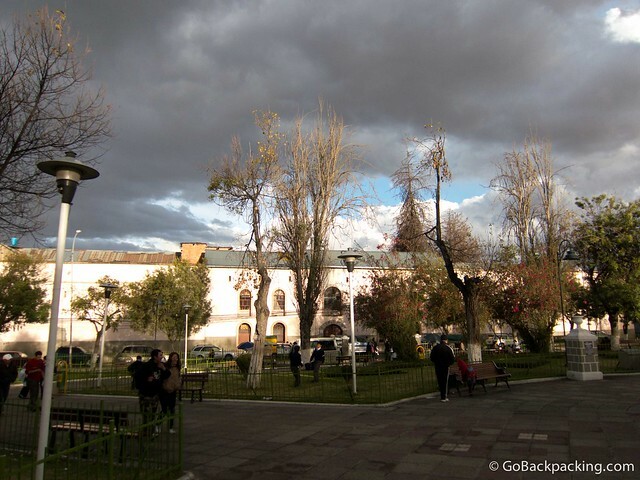 With less than 24 hours to experience La Paz, capital of Bolivia, I took to Facebook to see what my friends thought I should see and do in the city. Several were adamant I pay a visit to San Pedro prison. Asking follow-up questions lead to ambiguous responses, though it was clear I'd have to bribe security guards to get in. The name rang a bell, as I'd heard it in the context of a book called Marching Powder, which had something to do with cocaine and a notorious South American jail. But I didn't have time to read a book, and I didn't even bother to Google the prison, before my plane touched down on one of the world's highest tarmacs (4,000 meters above sea level). After checking into my hostel for the night, I located San Pedro plaza on a map, and grabbed a taxi. First, we drove up to a scenic viewpoint for a few photos, and then, I directed the driver to take me to San Pedro. The afternoon was slipping away, and a light drizzle was starting to fall from the grey clouds above the city. I was nervous. I trusted these two friends, as both had visited San Pedro on their own. Jason managed to sneak in as a visitor, while I believe Brendan paid a little money. I was carrying about $20 in Bolivianos, which I thought would be a sufficient amount for your average Bolivian prison guard. I was also carrying my iPhone and camera, which in retrospect, was not the brightest idea. Not being familiar with the book, nor having any experience bribing my way into Latin American prisons, I stood in the plaza wondering what to do next. The plaza across the street from the prison, by the way, is completely normal. Aside from four unmanned guard towers at the corners of the prison, there was nothing immediately obvious to give it away. A short line of Bolivian visitors were standing outside what appeared to be the main entrance. I didn't have the gall to stand in line with them, so I walked the prison's perimeter, biding my time. The walls were several stories high, but they looked to be made of mud. The front facade featured a nice paint job, while the other three sides were unfinished. By the time I was rounding the final corner, nobody had approached me about a tour, so I became more proactive, using my Spanish to ask a guard directly. Initially, he brushed me off, saying I should come back the next day. I responded that I was leaving La Paz in the morning, and this was my only chance. The guard said something to another one nearby. For a moment, I thought I could actually pull this off. But the second guard responded that no visitors were allowed after 4 PM. If he was telling the truth, then I was 30 minutes too late. I'd be boarding a bus the following morning for Lima, and I had no idea when I'd be back to La Paz. As I walked away from the prison, I noticed the street running by the front entrance had been closed to traffic. A large garbage truck had backed up to the door. A month later, I finally bought Marching Powder: A True Story of Friendship, Cocaine, and South America's Strangest Jail for Kindle. Once I began reading it, I couldn't stop. The story starts out a little slow, as Thomas McFadden, a convicted cocaine trafficker from the UK, tells of how he operated, and was ultimately set up by a Bolivian official who took his money, and helped ensure he was sent to jail. 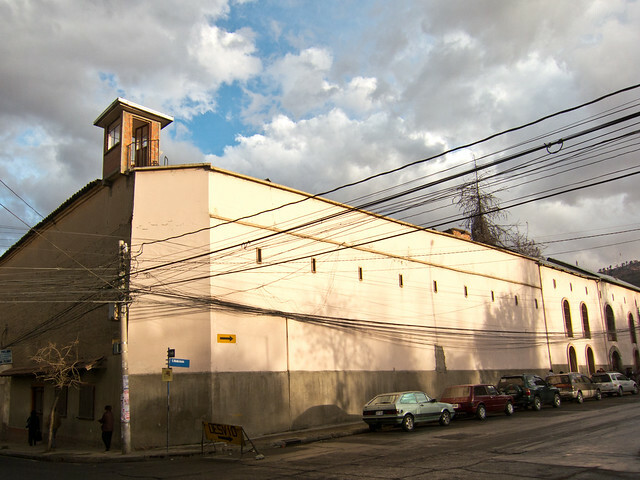 And Bolivian jail is where Thomas almost died of starvation and exposure (to cold) within the first few weeks. He was then transferred to San Pedro prison, which was a world unto itself. A world run by the inmates, where the purest cocaine in Bolivia was produced, and the wives and children of inmates often lived as well. Readers follow along as McFadden learns the rules of prison life under the wings of an inmate who takes a liking to him early on. The stories aren't too graphic, with the exception of the one in chapter 20, which details a mob of inmates killing three convicted rapists. I don't recommend anyone read that chapter. Witnessing the event seemed to leave McFadden with a case of post traumatic stress disorder, and because he recounts it in detail, it left me with feelings of unease for several days. Bribery was the name of the game, and McFadden soon had the Governor of the prison, guards, and many of the influential people inside, on his payroll. Yet as much money as he spent lining the pockets of officials, it would take him years to get a proper court hearing. During an outing, where he actually got to leave the prison under the accompaniment of a guard, he made his way to a nightclub, where he befriended an Israeli girl. Without the option to invite her to a hotel, he invited her back to his prison cell for the night. It takes a gutsy girl to spend the night inside a Bolivian prison, by choice, but she was soon staying there for days at a time. A romance developed between the two, and months later, she would be the one to spread the news of life inside San Pedro to other backpackers. The stories spread by word of mouth along the South American backpacker circuit. What started with a few of her friends visiting for an informal prison tour eventually lead to strangers showing up. McFadden used the opportunity to build a prison tour business, to the envy of rival inmates. As he describes it, the social companionship offered by the backpackers meant much more to him then the money it generated. His amazing story was captured and told through a backpacker named Rusty Young, who learned of the prison tours McFadden was offering through a mention in his Lonely Planet guidebook. The tours had been running long enough to get a mention in printed guidebooks. McFadden was proud of the fact that none of his visitors were ever robbed (which he explains, would've been the end of his business). Thanks, in part, to bribing his judges, McFadden was eventually released on December 28, 2000. He returned to England, and the most recent information I found on him was that he has since been living and working in Tanzania. Tours of San Pedro are still available, though it's a hit or miss proposition. With some advance planning, and a few days of free time, you can probably get in for a visit. But since my attempt, I've already heard of at least one group of tourists who were not allowed to leave before being robbed of their possessions. In other words, bring a little cash and leave the camera and phone at the hostel. Marching Powder offers a fascinating look at life inside a third world prison, as told by McFadden over his four years and eight months there.